Modular sectional crafted with all-weather wicker features deep seating in fade-resistant fabric, plus a matching ottoman and nesting table. 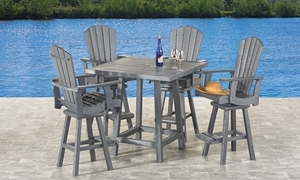 Casual pub height set includes 40-inch table and 4 chairs crafted from heavy-duty recycled plastics in fade-resistant slate grey. Grey weatherproof and fade-resistant Adirondack chair with comfortable curved back crafted from heavy-gauge recycled materials. 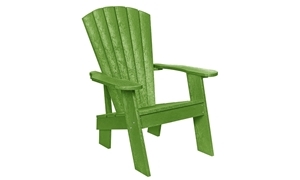 Green, eco-friendly Adirondack chair is built to withstand wind, rain and sun with an ergonomic design made of heavy-duty recycled materials. Classic orange Adirondack chair crafted with heavyweight, recycled materials for a durable outdoor piece that won’t fade in the sun. Ergonomically designed turquoise Adirondack chair crafted with heavy-gauge recycled materials is 100% weatherproof and fade-resistant. Heavyweight white Adirondack chair crafted from durable recycled materials won’t tip in the wind or fade from UV ray exposure. 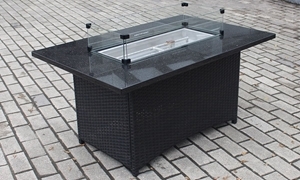 Pub height fire pit with durable aluminum frame features storage base, reusable glass burner beads, and 72-inch tile top. 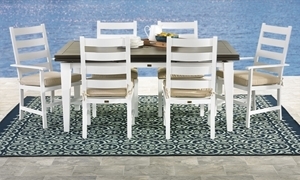 Haynes is all about making your home comfortable and stylish both inside and out. 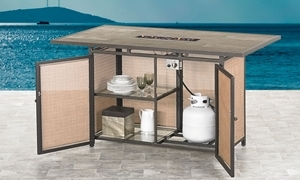 Our wide selection of patio & outdoor furniture features a variety of styles for every budget. 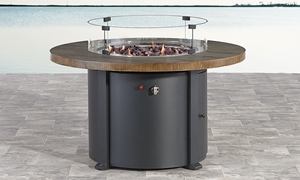 Whether you’re looking to outfit your deck with a lounge or dining set, want to add a fire pit to your backyard, or dream of basking in the sun on a new chaise or Adirondack chair, we’ve got you covered! 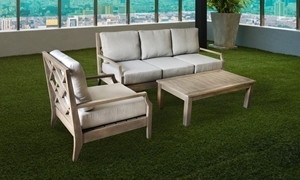 Moisture-, stain- and fade-resistant fabrics will brighten your day throughout every season, while premium materials like teak, resin wicker, and heavy-duty aluminum and steel guarantee durable patio & outdoor furniture for years to come.